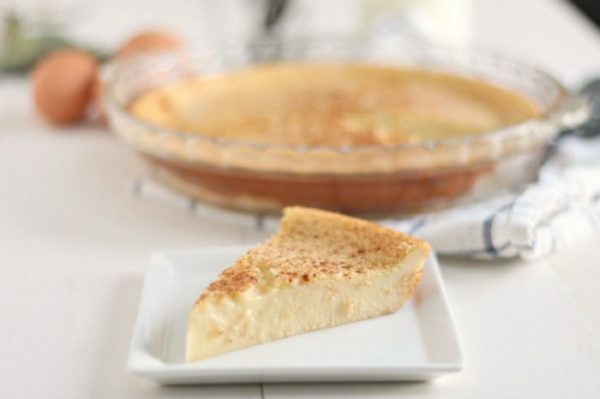 This classic custard pie recipe is so incredibly simple and delicious. 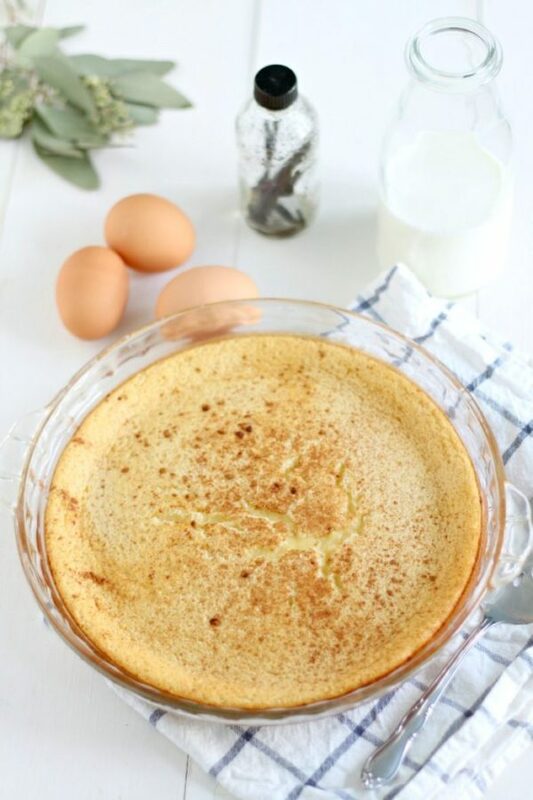 This old fashioned egg custard pie is a creamy and sweet dessert that takes less than 10 minutes to put together and a crust forms naturally while baking. It is an incredibly easy dessert with few ingredients. Just throw them in the blender, pour into a pie plate, and bake. Follow my tips below to make a ridiculously delicious custard pie. For this recipe you will need: whole milk. flour, honey, butter, eggs, baking soda, salt, vanilla, and rum extract (optional). Custard pie. Made with a blender and everyday ingredients. This is the pie you whip together when you have company coming and very little time to make dinner, much less dessert. I can put it together in under 10 minutes, and it bakes for 40. Eat it warm, or place it on the porch in December and enjoy it cold. I love complex recipes, but I don’t love the time they take. This pie is literally one of the easiest pies to make. I’ve been sharing a lot of recipes lately that involve eggs. Lots of eggs. I love the custard flavor, eggs are cheap, and I sweeten with honey or maple syrup, so these recipes are delicious without the empty calories. To add holiday flavor, there’s a splash of rum extract in there. Hence, the Rum Custard Pie. Go ahead and use rum, if you like. I don’t have a bottle of rum hanging around, but I usually have rum extract. The flavor brings back memories of those Butter Rum Life Savor candies. Remember? I loved them as a kid. Custard Pie… the perfect holiday dessert. So, if your family asks you to contribute something to Christmas or New Years dinner, here you go. So simple, very quick, and really delicious. I think your grandparents will be happy, too. Mine always enjoy custard. 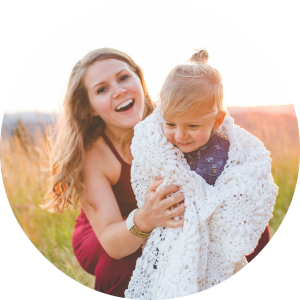 It typically goes with their upbringing and the frugal nature of the ingredients. Best of all, it’s a spin-off from the very popular “Impossible Pie”, which doesn’t require a crust. Yet, while baking, the ingredients will very handily form their own crust, saving you the flour, the butter, the time, and the sticky mess. You can substitute real rum for the rum extract. Use 5-6 tablespoons of real rum. and adjust for the added liquid by decreasing the milk by about 5 tablespoons. Try almond or vanilla extract instead of rum. Make sure to mix the baking soda and flour well or run through sifter so there are no clumps. Don’t over bake custard pie. It should still have a little jiggle. Recipe rated: Easy. This simple recipe can be put together in under 10 minutes (then baked for 40). It is easy enough for kids to help, just be careful with warm butter. Do you need rum extract? No this recipe can be make without rum extract and you can substitute vanilla or almond extract. Does custard pie have to be served warm? Nope, it is delicious warm or cool. I actually prefer it cool. Does this recipe need a pie crust? Nope. This recipe bakes up without a crust and creates it’s own crust. Could you add one? Probably. If you try it let me know. Blender (I have this one), pie dish, and a silicone spatula is all you really need. You could use a sifter if you would like. Warm your oven to 350, and generously butter your pie plate. Mix the baking soda with the flour, eliminating lumps. Or run baking soda and flour through a sifter. Add all of your ingredients except the cinnamon into a blender, and blend for several minutes, or until very smooth. Pour into the prepared pie plate, and lightly sprinkle cinnamon on top. Bake for 40-45 minutes, or until the top is golden and the pie is set. 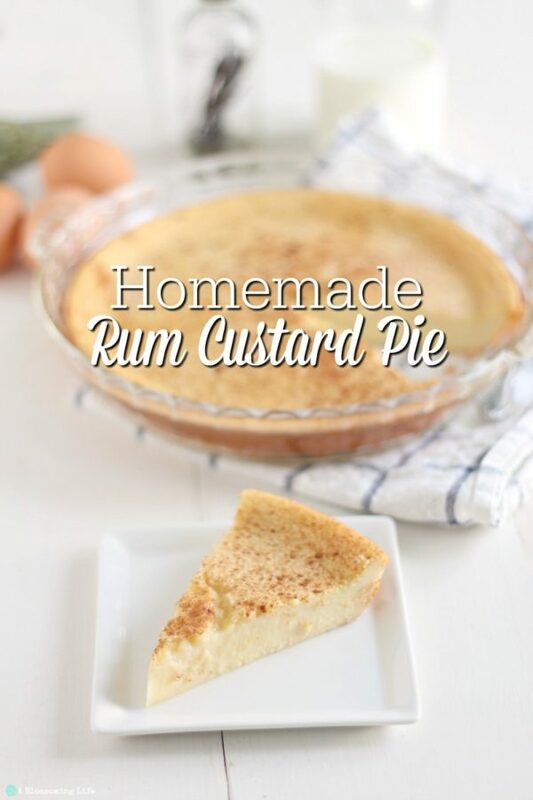 A classic old fashioned custard pie with a delicious rum twist. 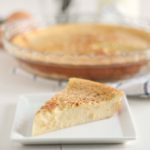 Old fashioned custard pie recipe is so incredibly simple and delicious. This custard pie is a creamy and sweet dessert that takes less than 10 minutes to put together and a crust forms naturally while baking. Throw a few ingredients in the blender, pour into a pie plate, and bake. For the 2 teaspoons of rum extract, you can substitute 5-6 tablespoons of real rum. To adjust for the added liquid, decrease the milk by about 5 tablespoons or just over 1/4 cup. You could also probably substitute rum extract with another extract like almond or vanilla. Want more holiday recipe ideas? Check these out! Spiced Baked Apple Dutch Baby Pancakes would make the perfect Christmas morning breakfast.